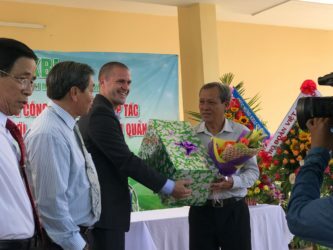 ANN ARBOR, Mich., – July 12, 2018 – Kraig Biocraft Laboratories, Inc. (OTCQB: KBLB) (“Company”), the leading developer of spider silk based fibers announces today that its subsidiary Prodigy Textiles has signed three agreements with local farming cooperatives in Quang Nam province, Vietnam. Under these agreements the farmers will produce the mulberry necessary to support the Company’s recombinant spider silk production. This collaboration with local farmers is a key element of Kraig Labs commercialization strategy, integrating advancements in high tech agriculture and a diverse supply base with the Company’s ground breaking spider silk production technology. 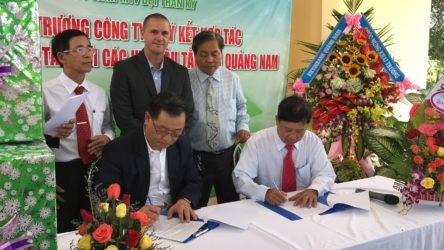 Prodigy Textiles Co. Ltd., signed three memorandums of understanding with independent farming cooperatives at a signing ceremony held at its recently announced new facility in Quang Nam province. The Company wishes to offer special thanks to its team of consultants who have put in considerable effort to assist us on this endeavor. Leading this project was Mr. Kenneth Le, whose dedication, resourcefulness, and business acumen has been instrumental in our ability to conduct business on the other side of the globe. Mr. Le has played a critical role in supporting scaling up the Company’s spider silk technology beyond the laboratory and with eyes towards the global textile markets.